PhM 1/c Claude O. French, husband of the former Blanche Wolfe, graduated from Electra High School, ETST College and College of Pharmacy, Denver, Colo. 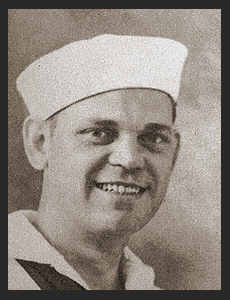 Entered Navy in Dec., 1942, trained in Corpus Christi, Texas, Key West and Miami, Fla., Portsmouth, Va., Philadelphia, Pa. and Camp Parks, Cal. ; served in Pearl Harbor, the Russells, Okinawa and Guam. Awarded Asiatic Pacific Ribbon with one Battle Star, Am. Defense, Victory Ribbons.